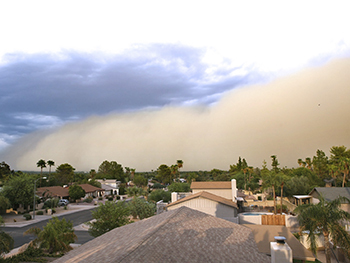 In the state of Arizona, a combination of high winds and arid conditions can give rise to windblown dust storms that reduce visibility and degrade local air quality. These naturally occurring events can cause sudden, dramatic increases in local PM10 concentrations measured by the U.S. EPA’s Air Quality System, resulting in violations of the National Ambient Air Quality Standards. STI, along with the Arizona Department of Environmental Quality, analyzed PM10 exceedance events suspected to have been caused by wind-blown dust. STI performed extensive meteorological and air quality analyses to assess whether the events satisfy the requirements of the EPA’s Exceptional Event Rule.